The FDA has scheduled the first public hearing on cannabidiol (CBD) for May 31, at the same time announcing a handful of other steps to ease this emerging ingredient into regulation. But the agency also emphasized that CBD is not allowed in food or beverage products at this time. CBD is a drug, according to the agency, and, like all drugs, must be studied carefully as it enters widespread use. The public hearing, "as well as a broader opportunity for written public comment," will give interested parties the opportunity "to provide the FDA with input relevant to the agency’s regulatory strategy related to existing products, as well as the lawful pathways by which appropriate products containing cannabis or cannabis-derived compounds can be marketed, and how we can make these legal pathways more predictable and efficient," the agency said today (April 2). The public hearing will be 8 a.m.-6 p.m May 31 at FDA's White Oak Campus,10903 New Hampshire Ave., Building 31 Conference Center, the Great Room (rm. 1503), Silver Spring, Md. The food and drug agency is forming "a high-level internal agency working group to explore potential pathways for dietary supplements and/or conventional foods containing CBD to be lawfully marketed; including a consideration of what statutory or regulatory changes might be needed and what the impact of such marketing would be on the public health." Principal Deputy Commissioner Amy Abernethy and Principal Associate Commissioner for Policy Lowell Schiller will co-chair it. The FDA also updated a webpage with answers to frequently asked questions on this topic to help members of the public understand how the FDA’s requirements apply to these products. At the same time, the agency noted it's issued warning letters to companies marketing CBD products "with egregious and unfounded claims that are aimed at vulnerable populations." "As we’ve stated before, we treat products containing cannabis or cannabis-derived compounds as we do any other FDA-regulated products. Among other things, the FDA requires a cannabis product (hemp-derived or otherwise) that’s marketed with a claim of therapeutic benefit to be approved by the FDA for its intended use before it may be introduced into interstate commerce. "Additionally, it is unlawful to introduce food containing added CBD, or the psychoactive compound THC, into interstate commerce, or to market CBD or THC products as dietary supplements. This is because CBD and THC are active ingredients in FDA-approved drug products and were the subject of substantial clinical investigations before they were marketed as food. … The only path that the FD&C Act [Federal Food, Drug, and Cosmetic Act] allows for such substances to be added to foods or marketed as dietary supplements is if the FDA first issues a regulation, through notice-and-comment rulemaking, allowing such use. "While the availability of CBD products in particular has increased dramatically in recent years, open questions remain regarding the safety considerations raised by their widespread use. For example, during its review of the marketing application for Epidiolex – a purified form of CBD that the FDA approved in 2018 for use in the treatment of certain seizure disorders – the FDA identified certain safety risks, including the potential for liver injury. These are serious risks that can be managed when the product is taken under medical supervision in accordance with the FDA-approved labeling for the product, but it is less clear how this risk might be managed in a setting where this drug substance is used far more widely, without medical supervision and not in accordance with FDA-approved labeling. "There are also unresolved questions regarding the cumulative exposure to CBD if people access it across a broad range of consumer products, as well as questions regarding the intended functionality of CBD in such products. 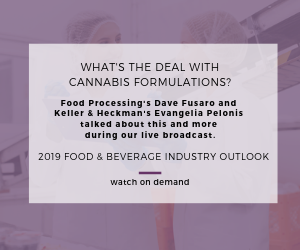 Additionally, there are open questions about whether some threshold level of CBD could be allowed in foods without undermining the drug approval process or diminishing commercial incentives for further clinical study of the relevant drug substance. "It’s critical that we address these unanswered questions about CBD and other cannabis and cannabis-derived products to help inform the FDA’s regulatory oversight of these products. "This is a complicated topic and we expect that it could take some time to resolve fully," the statement concluded. "Nevertheless, we're deeply focused on this issue and committed to continuing to engage relevant stakeholders as we consider potential paths forward. The working group plans to begin sharing information and/or findings with the public as early as summer 2019."